It’s no secret that Florida is one of the most popular destinations for RV’ers, especially in the winter months. RV parks in Florida are easy to find and range from rustic retreats all the way up to high-end private resorts. 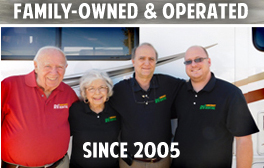 The typical RV’er is changing, too. More and more, working couples and young families are discovering the lifestyle, hitting the road on weekends and vacations – with a few even deciding to ditch their sticks-and-bricks home in favor of full-time wandering. Heading to the Sunshine State? Here’s a list of some of the best RV parks in Florida you should visit on your travels that offer a well-rounded experience that’s affordable and fun for everyone in your crew. We’ve got more than our fair share of natural wonders, but one of the most interesting has to be Florida Caverns State Park. See colorful stalagmites, stalactites and other formations on the cave tour. Hiking, biking, equestrian camping and kayaking on the Chipola River can be done right at the park, plus there is a 9-hole golf course located at the entrance. Hook up at one of 156 big-rig friendly sites at Gregory E. Moore RV Resort (it’s in the park) and take a tram down to one of the most unbelievable beaches in the state. Hiking trails showcase Morris and Campbell Lakes, two ultra-rare coastal dune lakes that can only be found in a handful of places in the entire world. If you’re planning to explore St. Augustine, you won’t find a better spot to set up base camp. Downtown is only 10 minutes away, but you’ll definitely want to set aside plenty of time to relax in the park too. Hit the beach, the trails or just relax in camp. You’ve got lots of options. The further you drive back on Fort Pickens Road in the Gulf Islands National Seashore, the further back it time it feels. 200 sites are nestled between the Gulf of Mexico and Pensacola Bay, offering a great location for hiking, beach activities (Langdon Beach is awesome), or exploring Fort Pickens and other military gun batteries nearby. It’s located in a section of Florida known as the Forgotten Coast, but camping here is anything but forgettable. St. George Island always gets plenty of love from Dr. Beach (it’s currently ranked as the third best beach in the U.S.), so you can imagine why it’s one of the best RV parks in Florida. Bring boats, swim trunks and plenty of sunscreen for this one. No trip to Florida is complete without checking out a crystal clear freshwater spring. Set up camp at Juniper Springs in the Ocala National Forest, and you’ll what the fuss is all about. Don’t miss a kayak or canoe trip down seven-mile Juniper Run, one of the most breathtaking and popular paddling trips in the country. Disney, you say? Yep, RV camping at Fort Wilderness is pretty darn nice. Of course, it’s about as family friendly as it gets – pet-friendly, too – and is an affordable lodging choice if you are planning to visit the theme parks. You’ll have easy access to the Magic Kingdom and the ability to see fireworks right from the campground. Give it a shot; you’ll definitely be surprised. This mega county park has it all – great beaches, excellent wildlife viewing and tons of history, making it one of the best something-for-everyone RV destinations. See the park by bike, by kayak or take a walk on one of several nature trails. Of course, you’ll want to set aside plenty of time for relaxing on the beach or in camp. It’s not common to hear lions roaring from your campsite – in Florida, anyway – but that’s exactly what you’ll hear at Lion Country KOA, making it one of the most unique, best RV parks in Florida. Big-rig friendly sites give you easy access to all the fun next door at Lion Country Safari, plus the campground is located about halfway between West Palm Beach and the eastern shore of Lake Okeechobee. Located at Mile Marker 36.8 on Big Pine Key, Bahia Honda State Park is one of the most sought after camping locations in the country. It can be a little tricky to get a reservation (this goes for everywhere in the Keys) so make sure to do some advance planning if you are looking to get a spot in paradise. There’s only one problem: you can’t stay forever.